1. Preheat the oven to 180˚C, gas mark 4. Put the cherries on a baking tray and toss with the sugar. Season and bake at the top of the oven for 25 minutes. Add the vinegar and the leaves from 2 thyme sprigs and stir well. Return to the oven for 10 minutes, until sticky and bubbling. 2. Meanwhile, make 18 deep cuts in the surface of the cheese with the tip of a knife. Stuff herb leaves and sprigs into these so that they penetrate the cheese. Place the cheese, in its dish, in a lipped baking tray. Bake for 15-20 minutes, until molten and bubbling. 3. Preheat the grill to medium-high. Space the bread slices out on a couple of trays in single layers and toast, in batches, for about 1 minute on each side, until golden and crisp. 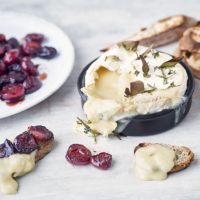 Serve the cheese with the sticky cherries and toasted bread, providing spoons to scoop out the melted cheese. Accompany with a crisp green salad, if liked.